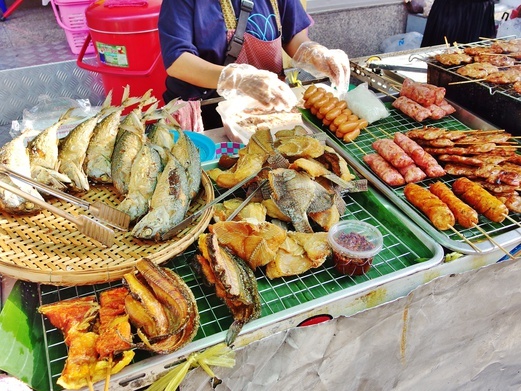 The most wonderful thing about staying at Patra Boutique Hotel was that we were right smack in the middle of what I thought was Bangkok’s best food street. 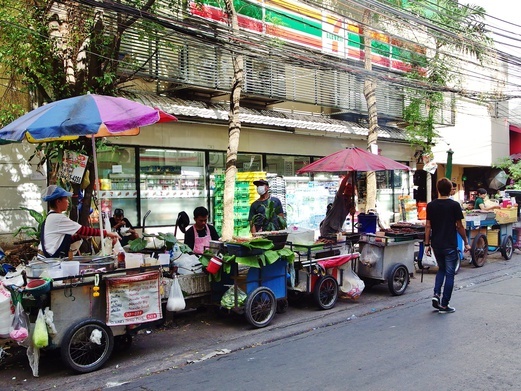 The moment we walked out our hotel, we would see all the Pratunam food stalls on the left and right. And it would be like this all day and night which meant it was impossible to get hungry or even peckish with such close proximity to a great selection of street foods. 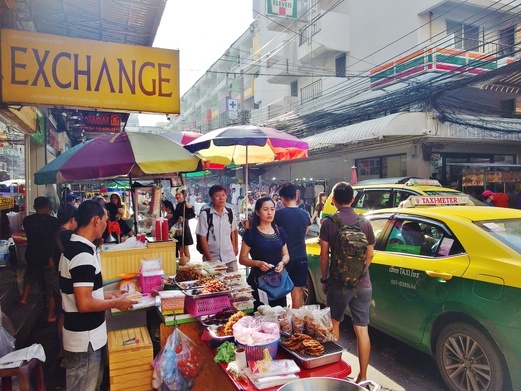 Food prices are relatively cheap at the Pratunam food street because this isn’t just a touristy area for shopping but a lot of locals come here to grab their meals too. Also, the quality of most stalls here was better than some I had tried elsewhere. Best of both worlds. 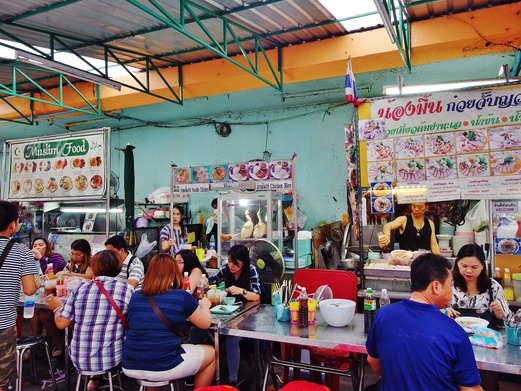 If you’re a foodie, this Pratunam food street is not to be missed. In the day (from as early as 7am), the streets in red would be bustling with street food vendors. It was like a designated area dedicated to food. The stretch in blue did have food stalls as well but they were more scattered amidst other products and goods like clothing, bags, accessories, etc, as this was within the main shopping belt of Pratunam market itself. 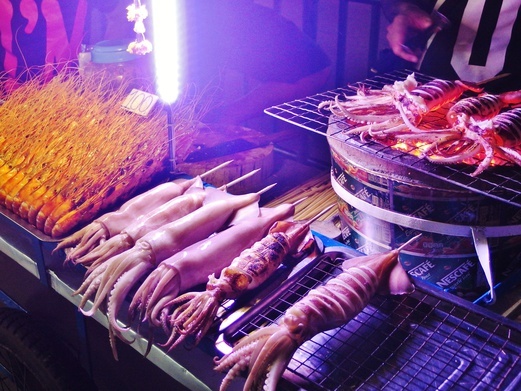 When night falls, you can still find food stalls at the upper T-junction area in red (behind Baiyoke Sky Hotel). Some of them remained open since morning and we also spotted new vendors that offer different snacks and nibbles. We had come down as late as about 11.30pm and we could still easily grab a bite. If you need a supper spot, come to Pratunam. This was one of my favourite stalls. 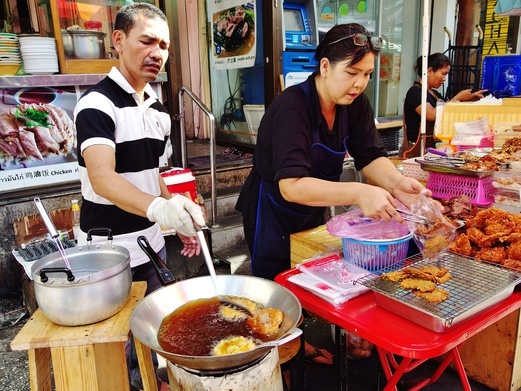 They served up delicious Thai fish cakes (30 baht per bag – these were the best ones I had eaten while in Bangkok) and crispy fried chicken with sticky rice. The moo ping (grilled pork on skewers) from this stall was tender and tasty though I thought the one from Central World market was even better because the marinate was so much more flavoursome. J was a big fan of those sausages which I didn’t really appreciate because they had a fermented taste. These were rice lunch sets that you could buy to go. There were crispy fried pork, basil pork, garlic pork & more. 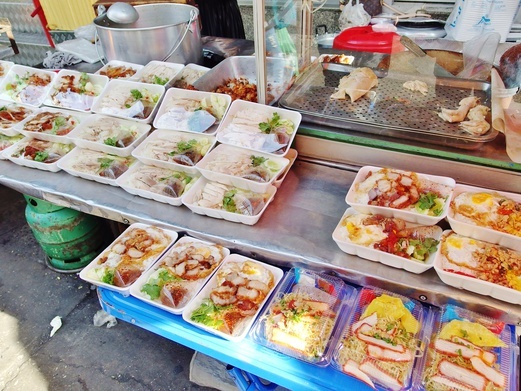 The chicken rice (30 baht) and wanton mee were not bad too. Quite a lot of varieties so you can basically try something different everyday. 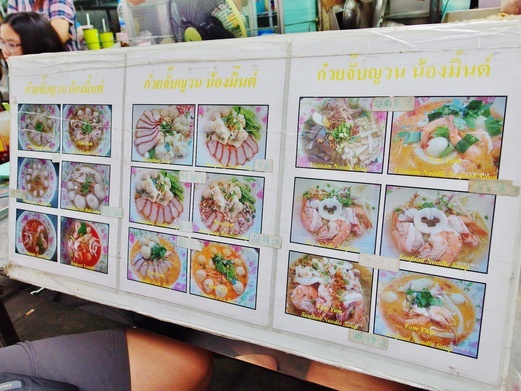 Tried this pad thai stall. Got wok hei, not bad. 50 baht per pack. 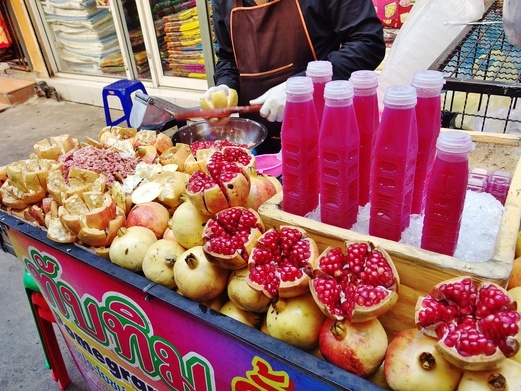 Another must try is freshly squeezed pomegranate juice. 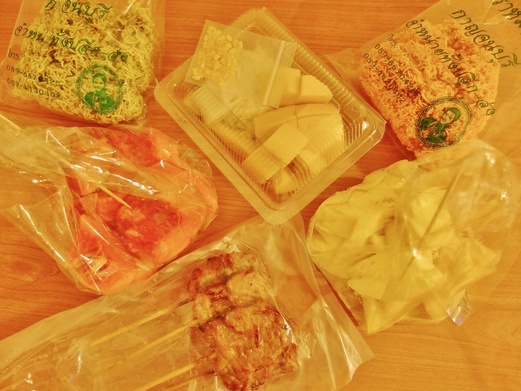 The cheapest one I came across was at Central World market which was 60 baht. 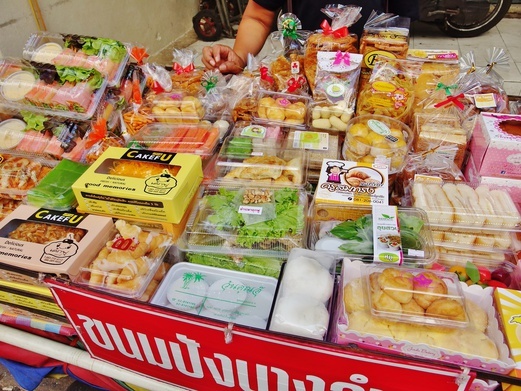 Those found around Pratunam area were in the range of 80 – 120 baht for small bottles. Pomegranates aren’t cheap and you can imagine how much pulp you would need to fill up a bottle. But it’s totally worth it because there’s no added sugar and it just tastes so sweet and refreshing. Very good for the sweltering heat in Bangkok. For breakfast, this market near to the cross-section of the stretch that I marked out in red on the map at the beginning of the post would be a good option. We tried the noodle stall. 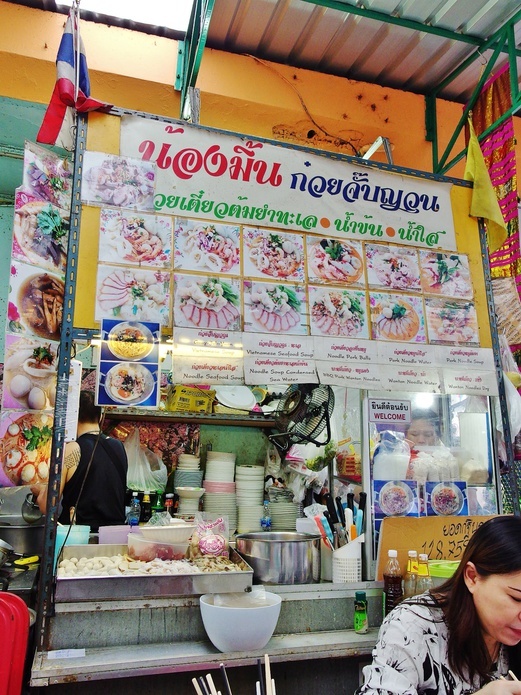 I had the Yentafo Tom Yum which was like yong tau foo and glass noodles in tom yum soup. The colour was red because of the addition of fermented tofu. There were prawns, squids, fishballs & fishcake in this. Nice. 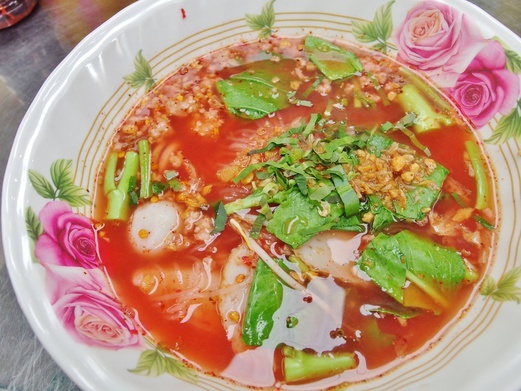 J ordered the Dumpling Tom Yum Noodle Soup which was really wanton mee in a tom yum broth. This was pretty good because the broth was soury and very appetising. Vegetables were crunchy and the dumplings were meaty. Both noodles cost 120 baht. Cheap and good. 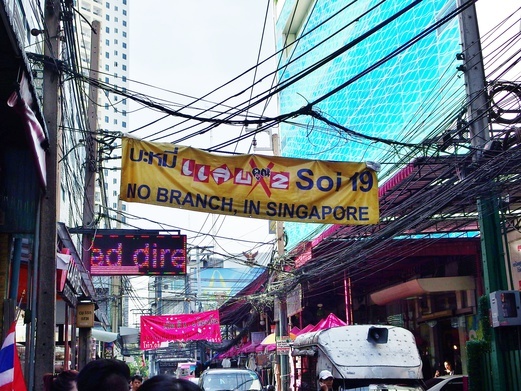 To get from the market to Petchburi Soi 19, you would have to cross this thing. It’s basically there to stop cars and motorbikes from going through. 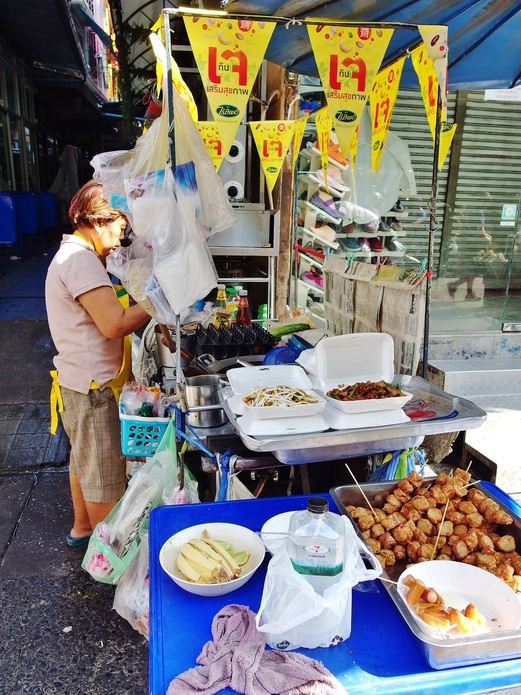 On Petchburi Soi 19, expect to see more street food vendors on both sides of the road. 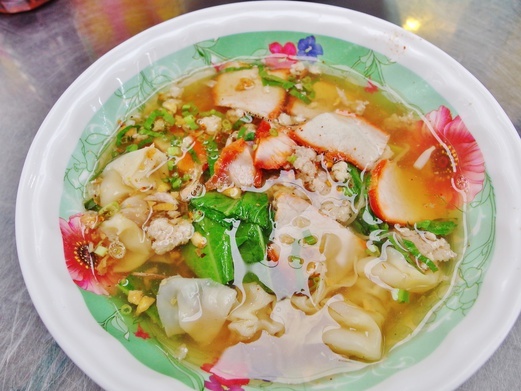 This Pratunam food street is also where the famous SabX2 wanton mee (Singaporeans’ favourite) is situated on. 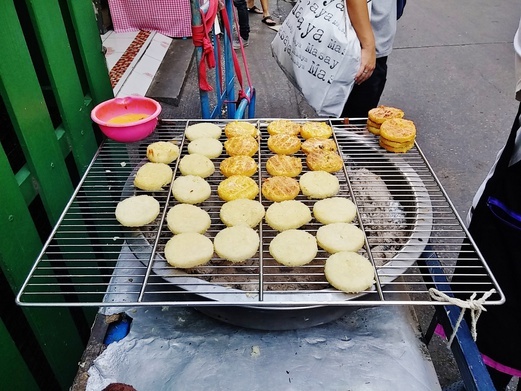 They were sticky rice cake patties coated with egg and then grilled over fire. 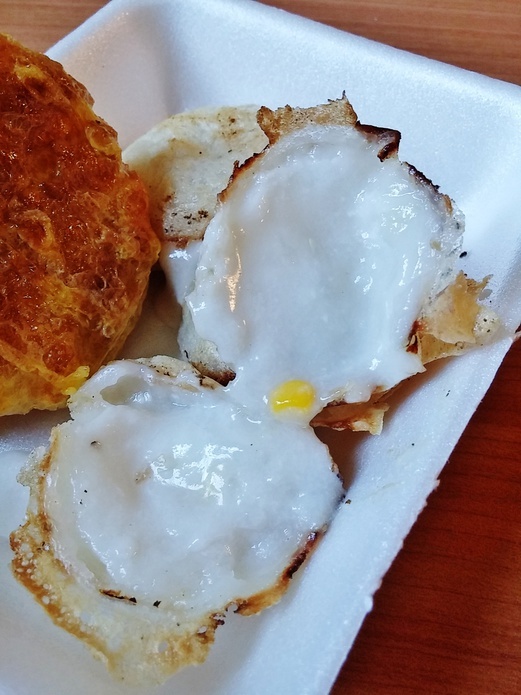 Almost like a french toast style of rice cakes. Turned out better than I expected. Rice was plain but overall it was eggy in taste. Outside was crispy and inside was quite soft. 3 pieces for 20 baht. 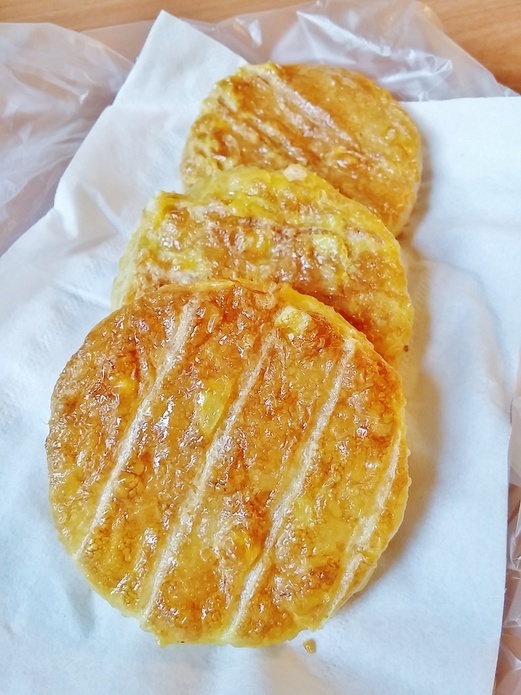 These coconut pancakes were our favourite. 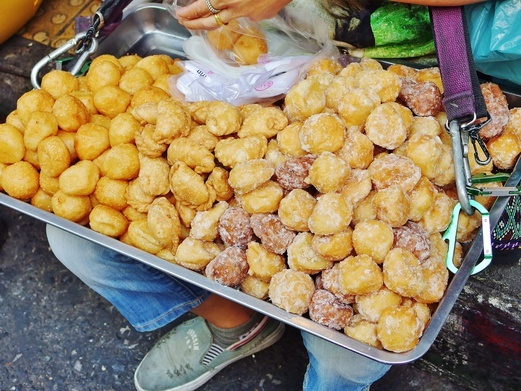 Whenever we saw them in the streets, we would just buy a portion to share. 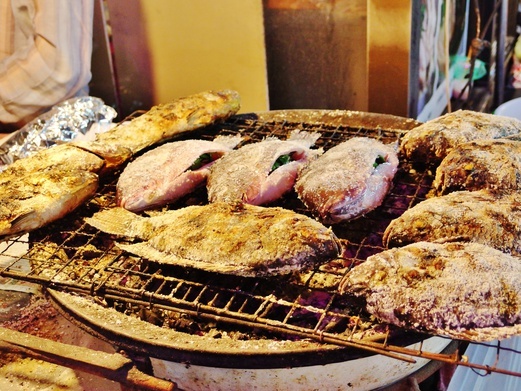 The best one I had was at Talad Rot Fai Srinakarin but the ones here were good enough to satisfy our cravings. Very creamy in the middle and the coconut milk flavour was very fragrant. 6 rounds or 12 halves for 20 baht. 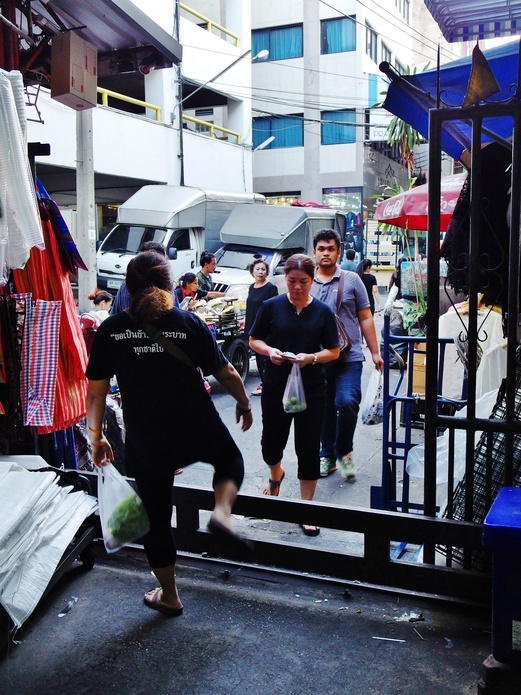 Spotted this woman near the main Pratunam market area. 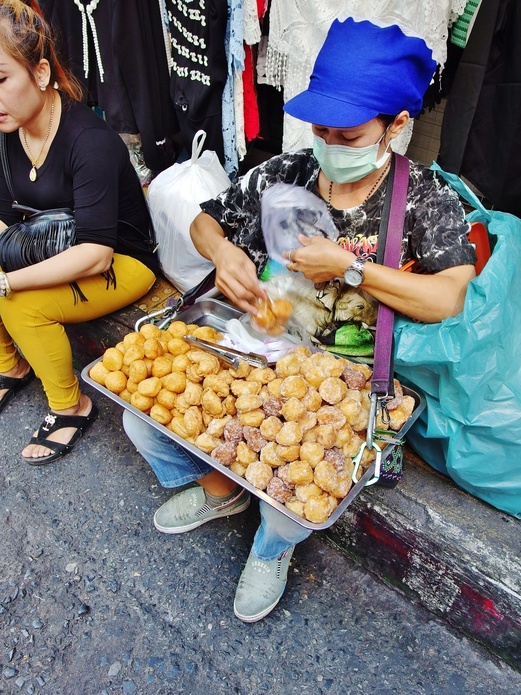 She was selling a range of fried snacks that looked like curry puffs and donut balls. After all that eating, you would of course need to get a drink to quench your thirst. I would like to recommend this drink stall that was located outside 7-11 as indicated above. Forgot to take a snapshot of the stall but it’s very easy to spot. 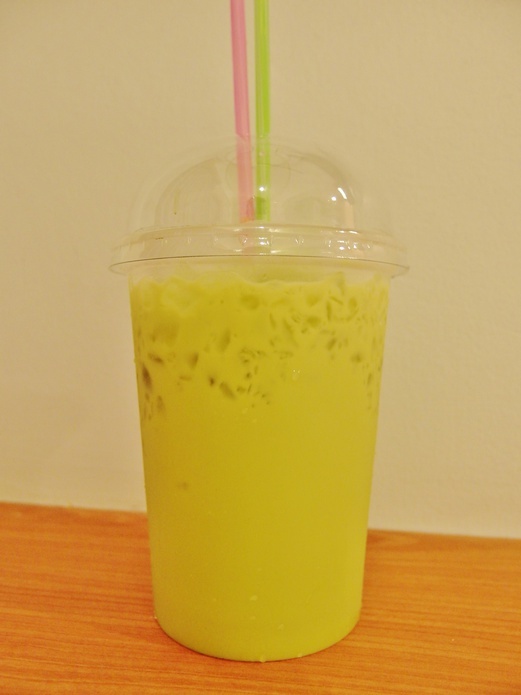 The drink stall uses the Cha Tra Mue brand of teas and the Thai Iced Tea and Iced Green Tea here were as good as the ones you would get from the actual Cha Tra Mue outlets. 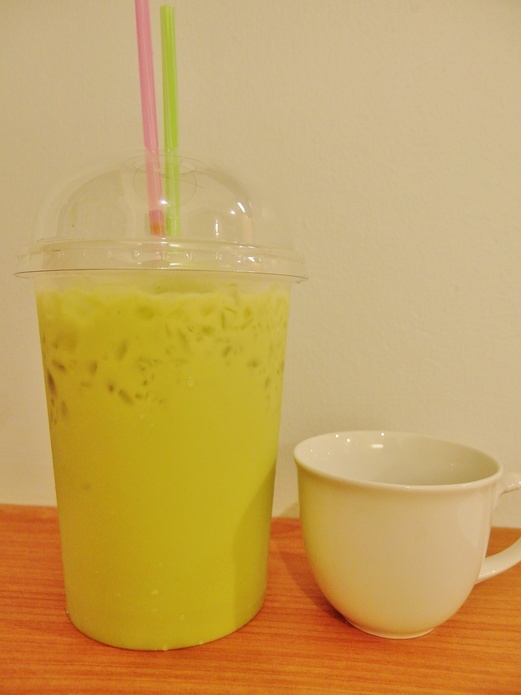 We would get one jumbo cup of Iced Green Tea (35 baht) every day. I liked that the young lady would add extra evaporated milk and overall, it wasn’t overly sweet or heavy. This was one of our morning breakfasts – everything devoured between the two of us, lol. By the way, if you come across the mixed rice stalls, you really have to try the bamboo shoots, cassia leaves curry and omelette – so good! 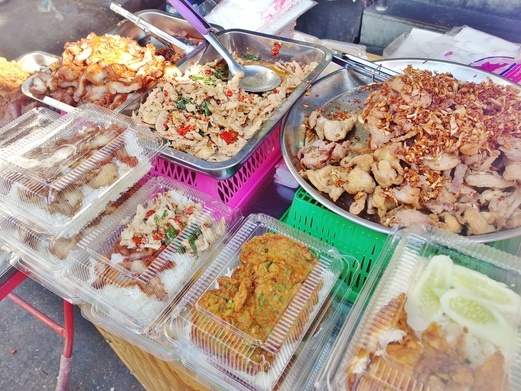 This portion of mixed rice we got cost 70 baht – price would depend on your choice of ingredients. 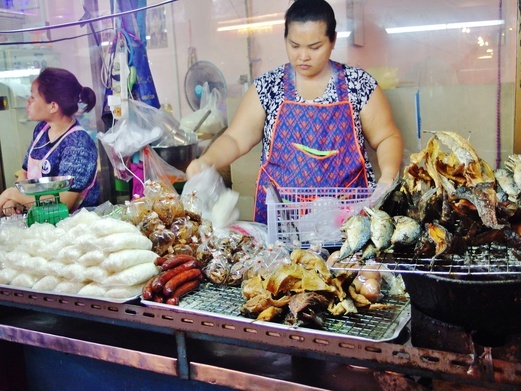 Sausages cost 15 baht per stick. One was a fermented sausage (which J liked) and the other had Thai fish cake flavour. 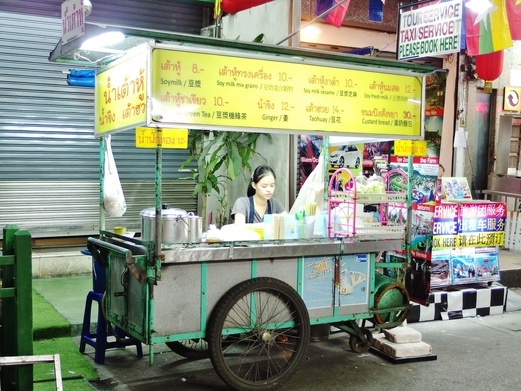 During the evening, we spotted this soy milk and tau huay stall but we didn’t fancy so we didn’t try. 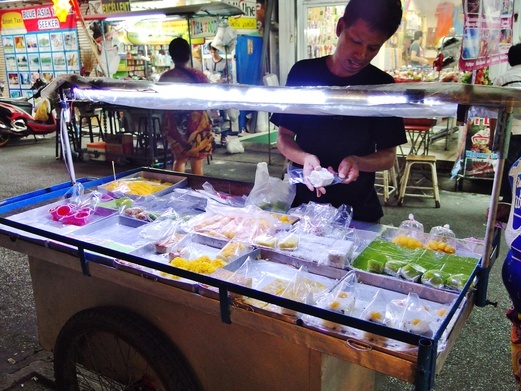 This kueh kueh man would come out at night just outside our hotel (Patra Boutique Hotel) and I was always amused by him because he would tell me his kueh is Thailand’s Number One, lol. Well, I hadn’t eaten enough Thai kueh to know what was good or bad but I must say I liked the variety of kueh at his stall. Taste was not bad but they were very sweet. 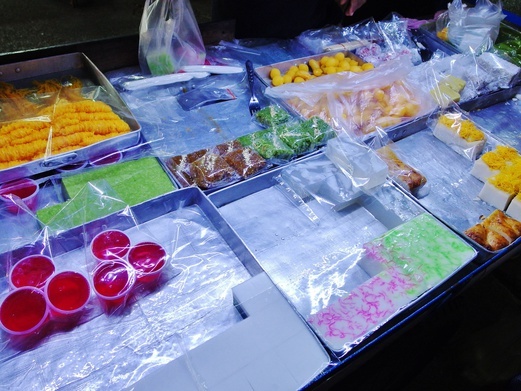 The kueh cost 10 baht per piece. 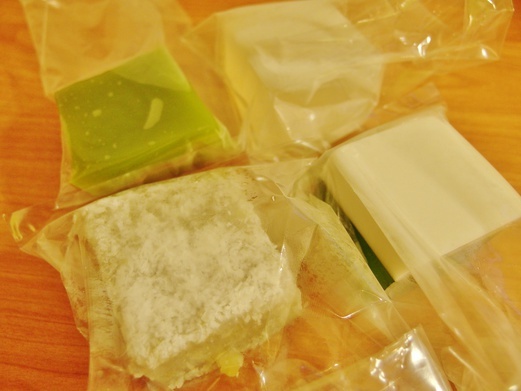 From top left in clockwise direction, we had the pandan version of Nonya-style kueh lapis, coconut water agar agar, pandan & coconut milk agar agar and banana kueh that had the texture of steamed tapioca kueh. All were very fresh. 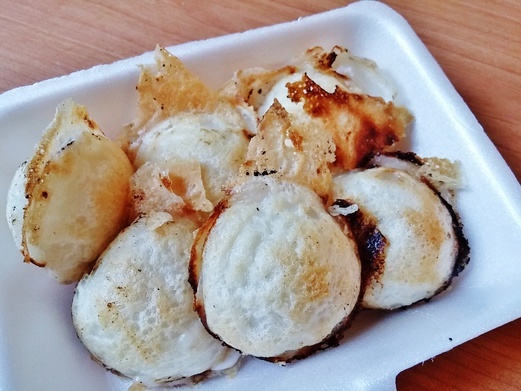 These khanom buang were crispy crepes with cream and coconut shreds or egg threads. They tasted like the egg rolls we would have during Chinese New Year but the cream was very sweet. 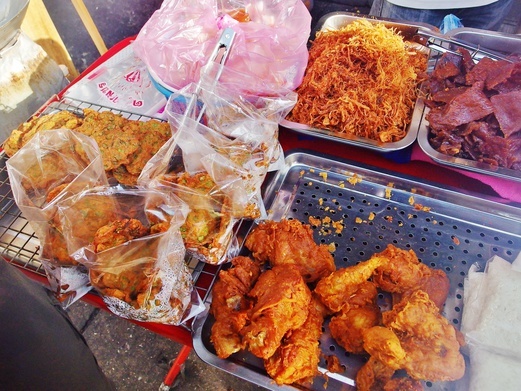 7 pieces for 20 baht. 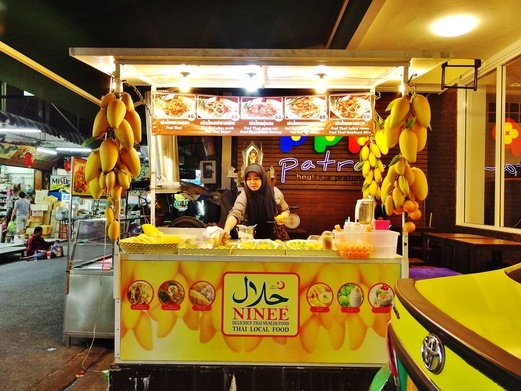 This mango sticky rice stall which was part of a Thai Muslim food stall was right outside our hotel entrance. 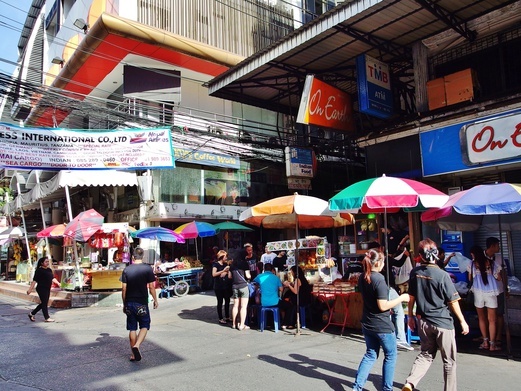 This was where we would buy our daily supper of mango sticky rice because the mangoes were very sweet and the coconut sauce was perfectly balanced without being saccharine. Also, the lady above was very warm and friendly to deal with. She would let you sample the mango and rice first and you can buy only if you’re happy with what you’ve tried. 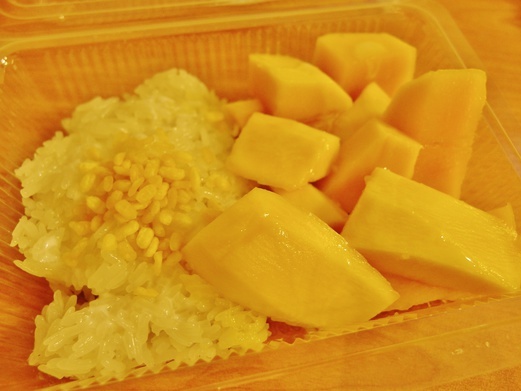 You can also request for the mango sticky rice to be securely packed so you can bring them back to Singapore and gift to your family and friends for them to enjoy. A serving like this cost 100 baht. This was one of our suppers. We bought the crispy rice noodles (top left and right) from Terminal 21. The fruit stall on our hotel street was superb. Every fruit that we had tried there was so sweet especially the papaya, watermelon and pineapple. And each bag only cost 20 baht. We also had moo ping that cost 10 baht per stick. Cheap cheap. 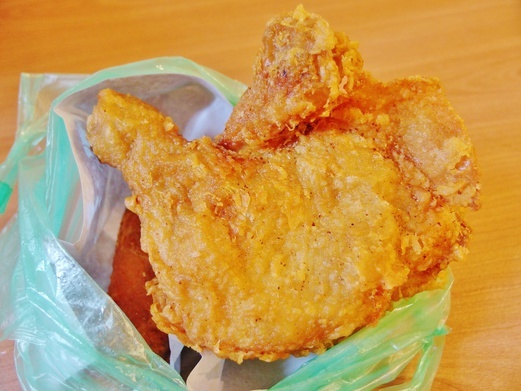 A sinful supper of fried chicken, lol. Again from the same street as our hotel. 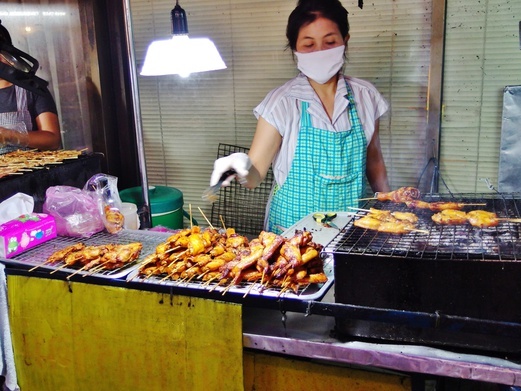 A whole chicken leg like this cost 40 baht. Very much like home-style fried chicken. Crispy on the outside and juicy on the inside. Nothing complicated about this. Just the classic fried chicken. Yum. By the way, if you’re thinking of trying coconut water, do not buy those that are already in cups with the coconut flesh in them. 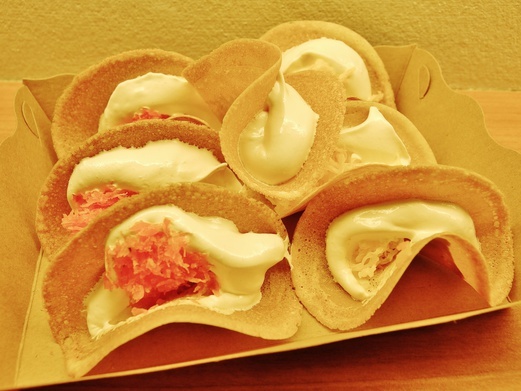 We tried them and they turned out to be really artificially sweet. Suspected the coconut water was mixed with syrup. So always go for those in a whole coconut and make sure the vendor only cracks open the coconut in front of you. Thank you for this post ! 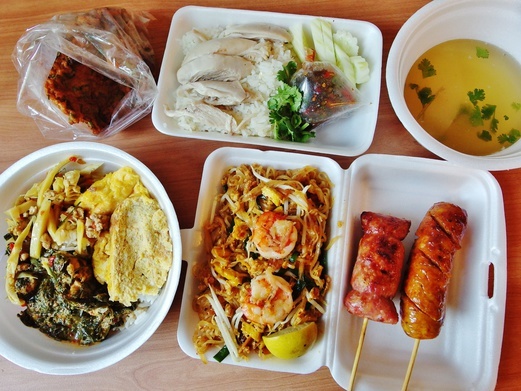 It has only confirmed my thinking that Pratunam was one of the best areas to stay in in Bangkok for my first visit this summer 🙂 The food looks so delicious !!!!!! Thanks. Will be at Berkeley Hotel across the street in Feb 2019. Re haggling: When the prices of goods are marked in big numbers, example – 300 bahts for shirts – do we start haggling at 200? How low can we go so as not to insult/irk the vendor? Try haggling if you’re buying more than one piece. For example if it’s 150 baht per shirt, get two and negotiate for 250. Many vendors don’t entertain low-balling these days – they would rather not do our business. But when you buy more, most will be happy to throw in a discount. Anyway, if you meet with an unfriendly seller, just leave. You’ll most likely find the same stuffs from another seller/shop. 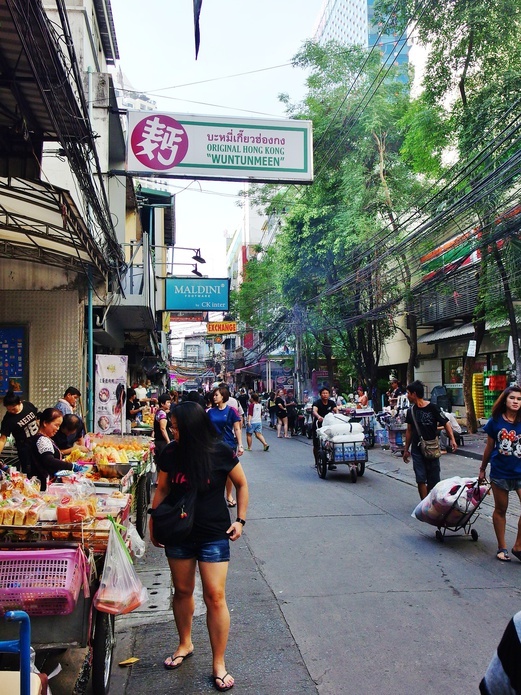 Happy shopping in Bangkok!